Give uniforms and gear a bold and unique look with Maxpedition's new line of morale patches. 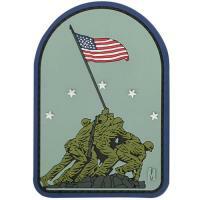 Featuring distinctive artwork by professional craftsmen, the Iwo Jima Morale Patch pays homage to soldiers of the past while encouraging those of presently serving. Constructed from a tough PVC rubber, the patch is designed to handle the extreme conditions that come with tactical and military operations without fraying, deteriorating or losing its integrity. The patch is secured by a hook-backing that firmly attaches to any loop surface, for effortless customization of helmets, uniforms, bags or other accessories. The inclusion of an additional loop liner protects the patch's backing and provides wearer comfort when sewn onto clothes and other equipment. Each patch is machine washable, for easy maintenance.